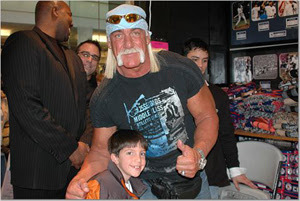 I met a guy the other day who met Hulk Hogan. I met Hulk Hogan. What I want to meet is Hulk Hogan's fanny pack. Aaaah, if that fanny pack could talk imagine what stories it would tell. Hulk Hogan loves the fanny pack. If you see a picture of Hulk Hogan look down below his waist... but don't let anyone see you do this. Anyway, look down there and there it is. The fanny pack was a popular accessory for men in the 1990s. Finally men could be like a woman and have a purse. I used to pretend I was a kangaroo and it was my pouch. I loved my pouch. I kept it in the front because I figured pickpockets would have less access to my stuff. I kept some good stuff in there, too. I think I had a roll of caps, a pair of safety scissors and my retainer. Since I was pretending to be a kangaroo I usually spoke with an Australian accent and called it my "bum bag". Occasionally people heard me talk about my "bum bag" and they thought I meant my "hobo bindle". That bag was really a bandanna tied to a stick. Hogan wears a fancy leather fanny pack, but it is still a fanny pack. I don't know why he wears it. Sure, if he was wearing his trunks and he had no pockets I could understand why. But I saw Hogan wear it with a tuxedo. Rodman's hat actually matches Hogan's fanny pack. 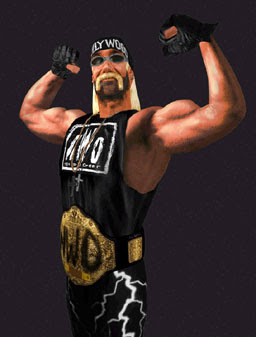 If you put Rodman's hat ON top of Hogan's fanny pack I bet it would be able to slam dunk The Hati Kid. Oh how I wonder what could be inside that fanny pack! It looks so full! Maybe he keeps a fake beard in there in case the NWO ever starts back up. If you don't remember this, be very thankful. 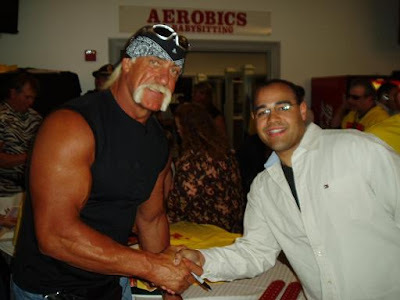 This guy apparently met Hogan at an "aerobic babysitting" convention. Hogan shakes his hand assuming that is what the fan was leaning over to do... I bet he was reaching out to touch his fanny pack. I know that is what I would do... I wonder if it's real leather, or just a leather-like material.... like Hogan's skin! Look how close that child is to the fanny pack! That kid will never be that close to greatness even if he becomes the next Bill Gates. 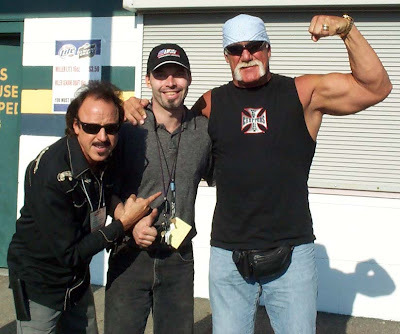 I bet the fanny pack was reluctant to be used for commercial purposes, but Hogan convinced him otherwise. 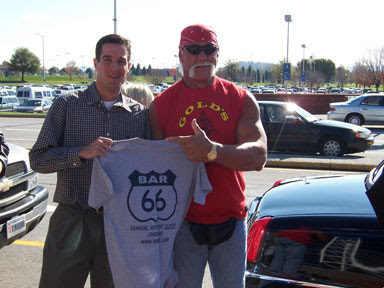 Maybe Hogan took the fanny pack to Bar 66 and got it drunk before asking it to sign the papers. Still, I would bet the fanny pack could drink Hogan under the table. 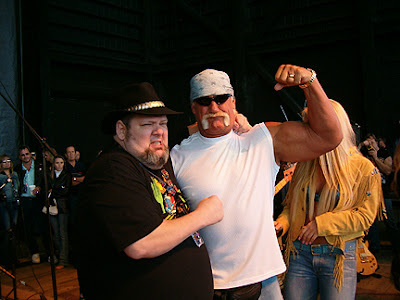 I am not sure who this guy is or why he looks mad at Hogan. 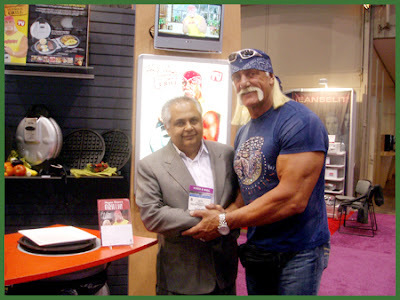 Hulkster appears to be suppressing a burp. Brooke-tini is in the background, but dad's propensity to flex his bicep has made her all but invisible. The fanny pack is right in the middle, basking in it all. It's a statement about life. It's art. It's the greatest photo ever. "Is that your fanny pack, or are you just happy to see me?" An article for John B.
Ooooh. PATCO. The very word makes my spell check cringe. Sweet spell check, I love you so, but you have a hell of a lot to learn about PATCO. Let's learn together. First I Googled "PATCO". 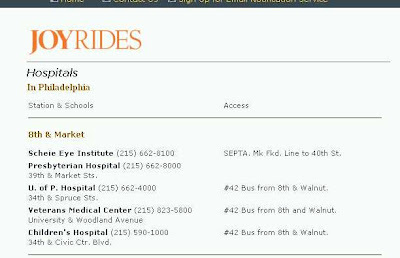 After learning about the Professional Air Traffic Controllers Organization, Patrick and Co. (an office supplier in San Fransisco) and a mind boggling number of people who misspell "PETCO" I found www.ridepatco.org. So PATCO is an acronym for something. And we can ride it. The Port Authority Transit Corporation! Taking a look at the top of the page we see a logo that says PATCO FREEDOM. At first glance it looks like PATCOFFEEDOM. Man I could use some caffine... and a pack of light bulbs some paper plates and The Kukla & Ollie Board Game. This has nothing to do with PATCO. I was just thinking of other things I need to buy this weekend. The PATCO site has a very interesting page on the history of PATCO. Nowhere do they mention the slogan "You can't spell 'pee on a taco' without PATCO", so I bet that isn't their slogan. Still the PATCO speedline has been a success for 30 years without that slogan. The PATCO Speedline operation on February 15, 1969, with the first trip from Lindenwold, New Jersey, to Center City Philadelphia. Back then, the 14.2 mile line carried 21,200 people per day. Today, more than 38,000 people rely on the Hi-Speedline to get them to work, school, sporting events, shopping and anywhere else they need to go-quickly, easily and without the hassles of driving. 30 YEARS OF SUCCESS! Wow. Of course my math says that it has been about 38 years since February 15, 1969. So I guess the first 8 years were pretty pathetic. 38,000 people rely on the Hi-Speedline to get them to work, school, sporting events, shopping and anywhere else they need to go-quickly! I often need to get to a bathroom quickly. I am going to call them. Or look for a taco. 38,000! Think about that. If you gave me a dollar for every person that rides on PATCO I would have something like $380,000. No wait, a dollar was probably worth less in 1969 so lets just say $350,000. Of course if we don't count the 8 years that they were unsuccessful that might lower the number substantially. Why don't you just buy me The Kukla & Ollie Board Game and we can call it even. 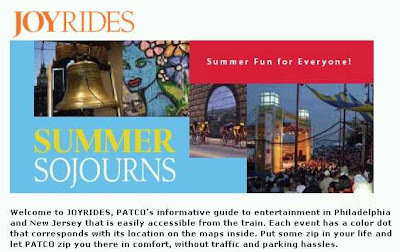 The other thing on the PATCO site that interested me is the "JOY RIDES". This sounds like fun to me because I like to steal peoples cars and drive them real fast until they run out of gas. So many fun places you can "JOY RIDE" to. You can go to the Liberty Bell, visit some of the beautiful universities or... go to... the hospital. Well I hope my neighbor left his keys in the ignition, I am goin' for a joy ride! I hope I get to see someone with a really bad rash or maybe even irritable bowels. 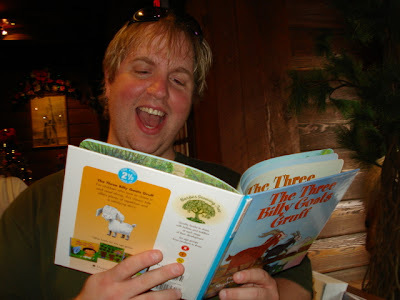 The book starts off well with talking goats. I love when things that can't talk start talking. Unfortunately a mean troll shows up. No, it's not Bob Costas. The troll drowns at the end and HBO cancels his show. Now the three goats are free to eat the delicious grass on the other side of the river, and to cross the bridge any time. Until the President diverts the special "Bridge Fixing Funds" to pay for his war... Hey look! 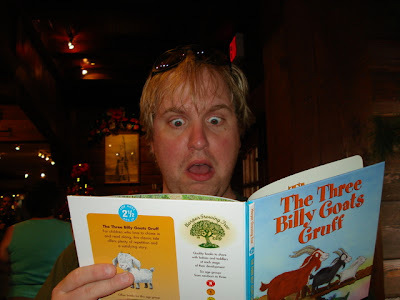 This book was written by Bill Maher! No wonder it wasn't funny. Born in Virginia, in 1758, Monroe attended the College of William and Mary. He roomed with William and briefly dated Mary. During his political career he joined the anti-Federalists in the Virginia Convention which ratified the Constitution, as elected United States Senator, served as Minister to France in 1794-1796 and helped negotiate the Louisiana Purchase. His ambition and energy, together with the backing of President James Madison, he won the Presidency in 1816 and easily won re-election in 1820. Early in his administration, Monroe went on a "Goodwill" tour. He played six sold out shows at Madison Square Garden before the tour moved to Boston. In Boston, his visit kicked off an "Era of Good Feelings." To demonstrate Monroe slid his hand into his trousers and was promptly thrown in the brig, ending the tour. Meanwhile, a painful economic depression was seriously harshing the mellow of the people of the Missouri Territory. In 1819 they applied to join the Union as a slave state. They were rejected, but the Union promised to keep Missouri's resume on file. They lied. A bitter dispute rose before congress and soon "The Missouri Compromise" was that Missouri's application would be accepted, but they would be assigned to "french fries" and wouldn't be allowed to work the register. The Missouri Compromise bill also paired slave state Missouri with Maine, a free state, and barred slavery north and west of Missouri. After his presidency ended he lived in Virgina, but left when he noticed that Virgina was "for lovers." He moved to New York. He once wrote that he "liked New York, except for the squeegee guys" and the "lack of officially licensed WWE apparel at F.A.O. Schwartz. He died in New York and was buried there. In 1858 he was dug up and re-interred to the President's Circle at Hollywood Cemetery in Richmond, Virginia. So, the ball's in your court New York. What is your next move in this never-ending James Madison chess game? -The first person to be married in the White House was Monroe's daughter Maria. -He once said "If America wants concessions, she must fight for them. We must purchase our power with our blood." -When he said "If America wants concessions, she must fight for them. We must purchase our power with our blood." He was referring to movie theater concessions. He would often pay for his popcorn by opening a vein. For penny candy, however, he usually just picked off a scab. -Was deeply in debt when he died. And he still owes a couple movies to Netflix. -James Madison is buried in Hollywood Cemetery in Richmond, Virginia. Famed stripper Madison James is buried in Richmond Cemetery in Hollywood, California. Right between Snub Pollard and Dennis Hopper. "In his rise from a log cabin to wealth and the White House, Millard Fillmore demonstrated that through methodical industry and some competence an uninspiring man could make the American dream come true. " -first paragraph of Fillmore's official White House bio. Put on your funny pants, because this fixes to be pretty dang boring. In his early political days Fillmore became a lawyer and was a member of the House of Representatives. In 1848 he was elected Vice President. 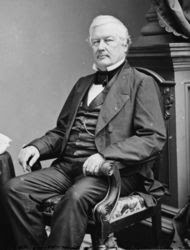 Fillmore presided over the Senate during debates over the Compromise of 1850. The bulk of the debate had to do with the pronunciation of several fruits and vegetables. Fillmore, always the individualist, believed that you should say po-tah-to not po-tay-to, but said to-may-to not to-mah-to. He also said ore-range not oh-range like Senator Setherbacker. Setherbacker finally compromised on tomato and potato and they both agreed to just "stay away from citrus fruits". The nation was saddened... eventually. There was no TV back then so most people got their news just by "making it up." On his plate was a a bill to make California a state. Fillmore carefully considered the proposition, since California brought into question many differing opinions regarding slavery. In order to have a well formed opinion on the subject, Fillmore became the first U.S. President to visit the Golden State. 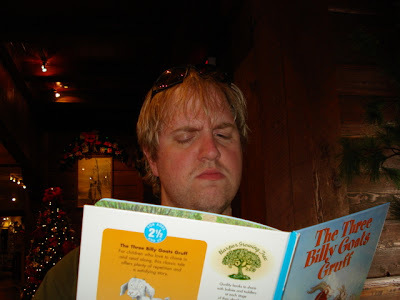 He toured many of the railroad sites, saw a guy riding a cow and spent a day at Disneyland. While there a young Walt Disney showed Fillmore his "Submarine Voyage" ride. "This is my submarine fleet." Disney said "It;s bigger than the U.S. fleet." Fillmore had the park destroyed. They didn't rebuild for almost 100 years. As his political party (the Whig Party) disintegrated in the 1850's, Fillmore was forced to join a new party. So in 1856 accepted the nomination for President of the Know Nothing Party. I guess he figured "I have a silly name, so should my party." Oh wait. Whig is a pretty silly name, too. Never mind. Throughout the Civil War he opposed President Lincoln. Lincoln ended up on the penny, five dollar bill, Mount Rushmore and specially marked boxes of Frosted Flakes. Fillmore has a strip mall named after him near Buffalo. He died in 1874 after suffering a stroke. His last words were "the nourishment is palatable." Fillmore, not satisfied with the amount of books in the White House, initiated the White House library. Fillmore was the first U.S. President born after the death of George Washington. During the last year of his presidency he sported a high-top fade with a Mets logo carved into the back. Rather than shake hands or bow he would greet people by punching them in the stomach and proclaiming "gotcha!" First U.S. President named Millard Fillmore... oh my god! Even the jokes about Fillmore are dull!